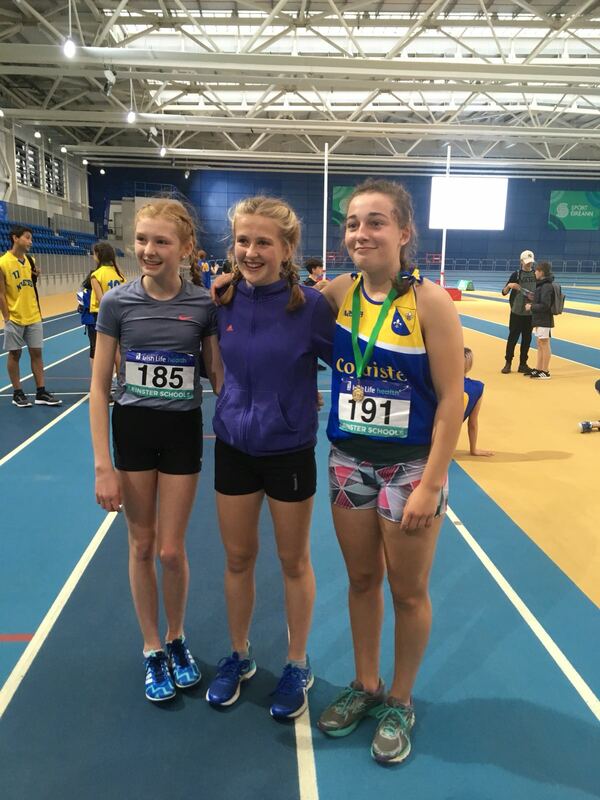 A small but talented group of Wexford athletes travelled to the Abbotstown Indoor Arena last Thursday for the Leinster Schools Indoor Combined Events Championships. Saidhbhe Byrne (Coláiste Bríd) won the Minor Girls. An excellent series of performances saw her comfortably in the lead, on a margin of 341 points, with only the fifth and final event, the 800m, remaining. She started with 9.68s in sprint hurdles, following up with 9.55m in Shot, 4.64m in Long Jump and 1.48m in High Jump. A pain in her side mid-way through the 800m had Saidhbhe gritting her teeth just to finish the race. Notwithstanding this she held on to take the Gold with 2809 points, a winning margin of 100 points. High Jump specialist Orlaith Deegan (FCJ Bunclody) placed 5th in Minor Girls on 2587 points. She was the top scorer in High Jump with a pb of 1.51m. She also bagged a pb in Long Jump (4.26m). Eimear Halpin (Loreto Wexford) was 9th on 2268 points with new bests in High Jump and Shot and a win in 800m (2.34 mins). Maeve Hayes (Loreto Wexford), another High Jumper, took the Silver in Intermediate Girls on 2899 points, just 83 points behind the winner, Shauna Leydon of Loreto Mullingar. As well as having the best effort in the High Jump (1.56m), Maeve was tops in the Long Jump (5.06m). Her other results: 9.78s in hurdles, 7.96m in Shot and 2.48 mins in 800m. Jack Forde (Wexford CBS) placed 2nd in Inter Boys with 2890 points behind winner, Alan Miley of St Kevin’s Dunlavin, on 3283 points. Miley trumped Jack in four of the five events – 9.99s v 11.86s in hurdles, 6.22m v 5.65m in Long Jump, 23.40s v 25.20s in 200m, 2.13 v 2.15 in 800m. Jack bettered him in the Shot: 11.86m v 9.99m. Tagged Leinster Schools Indoor Combined Events Championships 2018. Bookmark the permalink.